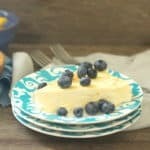 Bright lemony cheesecake is perfect for a simple, elegant, and delicious dessert. In a standing mixer fitted with a paddle attachment, combine all the ingredients except the berries on low speed. When the mixture is smooth, reserve. Grease the bottom and sides of an 8-inch springform pan with butter. Pour cake batter into the prepared pan, and smooth with an offset spatula. Wrap the bottom tightly with aluminum foil, and place in a large roasting pan. Pour hot tap water halfway up the pan. Bake for 45 minutes. Turn the oven off, but do not open the oven door. Let the cake cook with residual heat for 1 hour. Let the cake cool, and cover the top with aluminum foil. Refrigerate for 3 hours. Top with berries, and serve.